It is impossible to fully grasp the influence Stan Lee had over the world of popular culture since he first achieved fame in the Sixties. As a writer, editor and publisher of comic books, he, along with an extraordinary group of collaborators, revolutionized and expanded what could be said and done in that particular art form in ways that reverberate to this day. Later on, after years of tirelessly expanding his small publishing company into a multimedia corporation, the very same creations that helped change the world of comics forever—characters like Spider-Man, the X-Men, the Hulk, Iron Man, Black Panther, the Fantastic Four and the proverbial many, many more—would finally hit Hollywood and spawn a number of astonishingly lucrative and ambitious film and television franchises to boot. Even those who didn’t much follow the world of comic books or superhero films still knew who Lee was, thanks to his tireless promotion of his creations and of the comic book industry in general. His passing today at the age of 95 truly marks the end of an era, although the creations he helped shepherd during that era show no signs of fading away anytime soon. He was born Stanley Martin Lieber on December 28, 1922 in Manhattan and later moved with his family into an apartment in the Bronx. An aspiring writer, Lee graduated early from high school in 1939 and joined the WPA Federal Theatre Project before an uncle helped to get him a job as an assistant at the then-new Timely Comics publishing company. Although his initial duties were humdrum—filling inkwells and such—he soon made his debut as a writer by penning a short piece that appeared in “Captain America Comics #3” in 1941, utilizing Stan Lee as a pen name for the first time. He soon moved from writing filler to full stories and in 1941, he debuted his first superhero co-creation, The Destroyer, in “Mystic Comics #6.” Later that year, after a management shake-up, the then-19-year-old Lee was installed as interim editor and showed a flair for the job that would find him remaining in the position of editor-in-chief until 1972, during which time Timely would evolve into Marvel Comics. After serving in World War II as a member of the Signal Corps, Lee returned to Timely in 1945 and over the next decade or so, during which time the company became known as Atlas Comics, he worked on stories in a variety of genres and even co-produced a syndicated comic strip based on the popular radio show “My Friend Irma.” None of these efforts were particularly notable and an increasingly frustrated Lee considered leaving the industry for good until his publisher, Martin Goodman, made a request—since chief competitor DC Comics had just found success with its superhero team the Justice League of America, could Lee come up with a series based around a team concept as well? With nothing left to lose, Lee rose to the occasion but instead of following the DC model in which superheroes like Superman were square-jawed paragons of virtue devoid of even the tiniest of flaws, his heroes would have any number of imperfections—ranging from emotions like jealousy, anger, vanity and depression to basic matters like paying bills, getting ahead in school or trying to get up the nerve to ask someone on a date—that he felt would strike a chord with younger readers who were themselves going through many of those problems and sensations themselves. The group that he and artist Jack Kirby devised utilizing this approach, the Fantastic Four, proved to be an instant success when it debuted in 1961—the time when the company finally changed its name to Marvel. Over the next few years, Lee helped usher in an astonishing array of characters in stories that deftly juggled the fantastic with real-world concerns. With Kirby, he co-created the Hulk, Thor, Iron Man and X-Men, devised Daredevil with Bill Everett and joined forces with Steve Ditko to bring about Doctor Strange and Spider-Man, the latter proving to be Marvel’s most popular creation. In what would prove to be a genius move, all of these characters, and many more to come, would all exist within one shared conceptual universe and some of these characters would band together into a new team known as The Avengers. The fact that you almost certainly did not require any sort of explanation or description of the characters that I have cited in this paragraph should give some indication as to just how popular they would become over the years. The Marvel comics stood out from the competition as they strived to truly resonate with readers. By introducing stories with more serious themes and increasingly complex characters than one normally found in comic books, they not only changed what could be done in the format but also helped to vastly expand their readership by telling stories that kept readers interested even as they grew older while attracting new ones as well. Marvel also helped to pioneer the notion of forging a connection between the people who created the comics and those who consumed them. Under Lee, Marvel would introduce such innovations as explicitly crediting those responsible for the creation of the various comics, including inkers and letterers. He also included such creations as a letters page, “Marvel’s Bullpen Bulletin,” a section talking about members of Marvel’s staff and what was in the hopper and the monthly column entitled “Stan’s Soapbox.” These behind-the-scenes glimpses afforded to readers made them feel as if they were truly a part of something special and they pretty much helped to lay the groundwork for the vast world of contemporary fandom—what is ComicCon, after all, but a “Bullpen Bulletin” writ extra-large. During the Sixties, Lee worked as a writer, art director and editor for most of Marvel’s series and continued to help expand on the kinds of stories that a comic book could tell. “Spider-Man,” for example, would deal with such hot topics as politics, drugs, student protests and the war in Vietnam. He would help break the racial barrier by introducing the African-American character Robbie Robertson in a supporting role in “Spider-Man” and, with Kirby, would co-create the first major black superhero character, Black Panther. Social commentary would also crop up in his “Stan’s Soapbox” columns and he would also prove to be influential in the eventual easing of the once-powerful Comics Code, which had been introduced by the comics industry in 1954 to govern what could and could not be shown in order to avoid official government regulation. In 1972, he stepped down as editor-in-chief at Marvel and assumed the role of publisher. Although his later years would find him involved with any number of ventures—some more successful than others—his chief role would be to serve as the sort of friendly uncle figurehead for the entire comics industry thanks to his countless appearances at conventions, college lectures, signings and anyplace else that he could use to help further the reach of his creations. 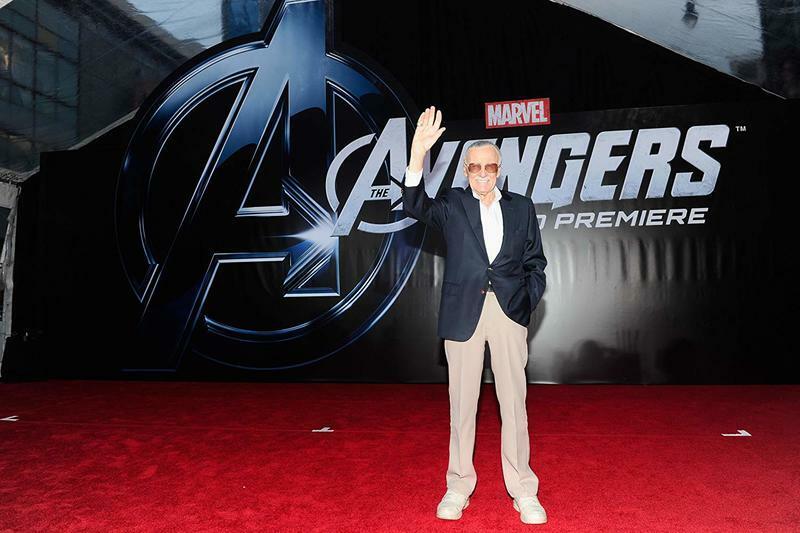 In 1981, he moved to California in an effort to help develop Marvel’s numerous properties into films and television series in the wake of the success of the 1978 blockbuster “Superman,” and while there were shows and TV movies based on “Spider-Man” and “The Hulk,” the movies did not quite work out—there were always announcements of future films but they would always fall apart. Eventually, Hollywood began bringing Marvel’s creations to the big screen and inspired massively successful franchises based on “Spider-Man,” “X-Men” and “The Fantastic Four.” This led to the development of what would become known as the Marvel Cinematic Universe, a concept inspired by the shared universe notion of the comics in which the different movies would overlap and characters from one series might turn up in another. One element that practically all of these films had in common—whether part of the MCU or not—was the presence of Lee himself, who would turn up in cameos (often of a cheerfully self-referential nature) that fans would gleefully search for in the way that cineastes once kept an eye out for when Alfred Hitchcock would turn up in his films. From a financial standpoint, the influence that Lee and his work would have on Hollywood is undeniable—the three phases of the MCU (which has expanded to include television shows, comics and digital series) has generated billions of dollars and transformed the industry into one more focused on ever on creating ready-made blockbusters that can earn tons of money throughout the world. From an artistic standpoint, one could argue that there have been so many superhero movies in recent years that have tried so hard to top each other in terms of sheer spectacle that a certain degree of fatigue has set in. But as it turns out, the best Marvel films have been the ones that have taken Lee’s example to heart and have taken risks that may have seemed incredibly chancy at first but which proved to pay off beautifully in the end: The notion of putting a performer as off-beat as Robert Downey Jr. into the role of Tony Stark/Iron Man, a merging of actor and role that made “Iron Man” (2008) such an influential hit; The decision to allow Ang Lee to transform “Hulk” (2008) from a superhero saga into something resembling an actual art film. (This did not endear it with most moviegoers but the resulting film is a genuinely great example of cinematic pop art that deserves a reappraisal); The increasing narrative ambitions of the “Captain America” films leading to the wonderful and provocative “Captain America: Civil War” (2016); The willingness to take a chance on a offbeat indie filmmaker like Taika Waititi and allow him to take arguably the dullest of the Marvel movie stable, Thor, and liven it up with goofball humor in the throughly engaging “Thor: Ragnarok” (2017). And, of course, “Black Panther” (2018), a film which thoroughly upended most notions of what a superhero movie needed to succeed and ended up becoming the most financially successful film featuring a solo superhero as well as the first film of the genre with a more-than-legitimate shot at a Best Picture nomination. Although Lee, as I mentioned, did make appearances in pretty much all of the movies inspired by his comic book creations, his most notable screen appearance would be in a film set far outside the universe he created. This would be in “Mallrats,” the 1995 comedy that Kevin Smith made in the wake of the success of his controversial debut “Clerks.” While the film would prove to be a flop at the box-office that Smith and others would use as a sort of punchline for years, it is actually a much better film than its reputation would suggest and one of the best things about it is Lee’s appearance. Playing himself, he is at the mall where the film is almost entirely set for a signing and winds up encountering Brody (Jason Lee), the vulgar and obnoxious comic book obsessive who has just broken up with his girlfriend as the story begins. Upon meeting his hero, Brody begins hammering his hero with the kind of questions that Lee was no doubt inundated with throughout his life (along with some involving superhero genitalia best left untouched here). Instead of just brushing him off, Lee begins to genuinely converse with Brody about life and love in ways that cut through the kid’s bombast and braggadocio in order to get in touch with his real emotions. Yes, the scene is very funny but in just a few short minutes, it essentially sums up what made Lee such an important and necessary figure in the lives of so many people—he used his talents to create work that reached out to fans and meant something to them in ways that other forms of disposable popular culture simply didn’t. It’s what separated him from the rest, and why his name and work will continue to last long after his passing.